Take steps now to make sure your dog or cat come home if they are ever lost! A FREE online pet profile that you can manage. In addition to your contact information you can add photos, medical info, dietary needs or even your pet sitter’s information. It’s your profile to manage. A 24 hour call center at-the-ready to help your pet get home if he or she gets lost. 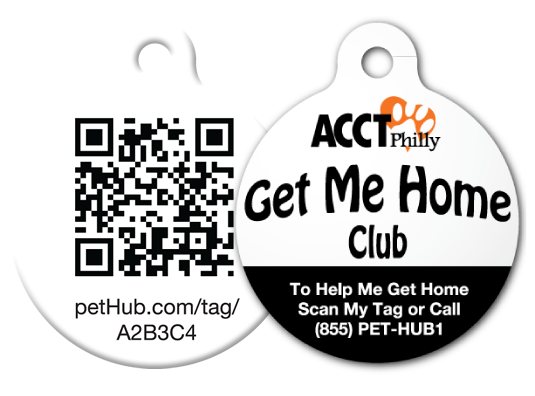 The ability to link your Philadelphia dog license information to your Get Me Home Club tag. There’s no need to have two tags when you upgrade to a Get Me Home Club ID! Instant emails whenever your pet’s tag is scanned! GPS mapping of the approximate location where your pet was located when the tag was scanned! The option of emergency medical insurance to cover injuries while a pet is lost ($3K coverage after $50 deductible)!